These days, there is a lot of ideas around using a building information model for facilities management. Among these ideas, a recurring theme is to integrate documents, mostly technical sheets, directly into the model. 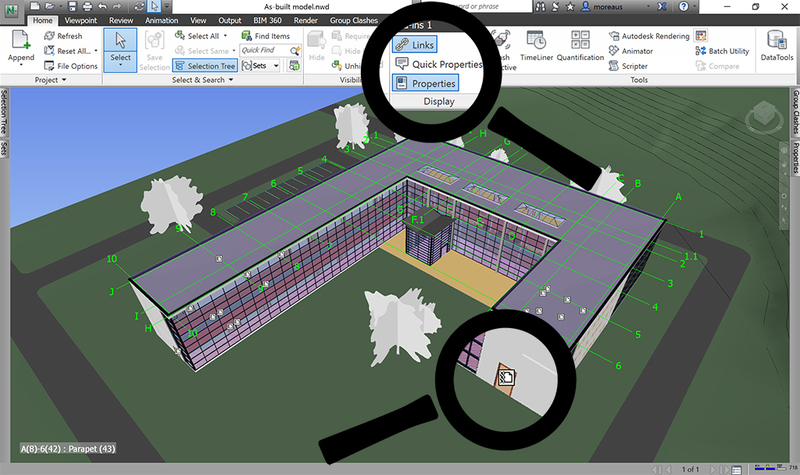 Aside from the fact that I don’t see how a model build to design, analyse, and coordinate a building could be use directly in facilities management, there is also some non-trivial technical problems to overcome to have any documents properly linked to your model, whether you are using Revit, Navisworks, or an IFC viewer. Below is a list of these technical problems, and some though on how to solve them. Adding a link in Revit is fairly straightforward, you just have to use a “URL” parameter (shared or built in), and type in your link. Since a technical sheet is generally the same for every building element of a given type, it makes more sense to me to add it in a type parameter. As you can see, I type in a relative path to my technical documentation, this allows me to move around the entire “As-built documentation” folder (models and technical sheets in PDF) without breaking the links. I end up with a pretty simple folder structure, with a model at its root, and the technical sheets nicely ordered in one folder per category. If you click on the small “… “ button in Revit, your linked technical document will immediately open in the associate viewer, here, Acrobat Reader. Selecting equipment and material is generally done through spreadsheets or building economy software, and by people who could not be proficient with Revit. Therefore, I have searched for solution to do it outside Revit. The new Flux Scheduler is an application based on Flux, which allows us to create online schedules from data uploaded through the Revit Flux plugin. Once exported to Navisworks, the “Link” button will display a small link button on every linked object, which open the linked technical sheet. If you export this Revit model to IFC, and open it in Solibri Model Viewer, you can display the link, but not click on it. 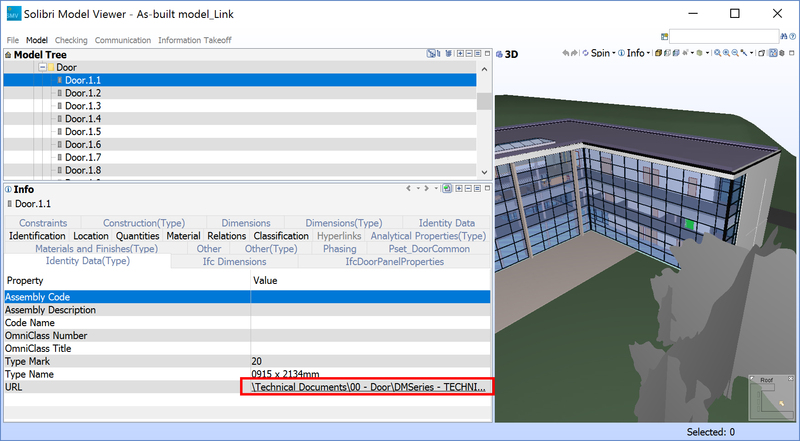 However, by writing a “" before the link in Revit, Solibri Model Viewer recognize it as link and you can open the technical sheet with a click. This could obviously become problematic in Revit, since when you add this “", Revit doesn’t recognize the link anymore. Tekla BIMSight, on the other hand, couldn’t recognized any of those links as a clickable item. As you can see, they are many ways to link documents to a model and retrieve them in a viewer, and a few things could go wrong along the way. So, before starting anything, I would recommend to make sure you can link or embedded documents in your deliverables and structure these deliverables accordingly.